Any season that lets us have fun decorating, baking and any other fun is a favorite for my children. 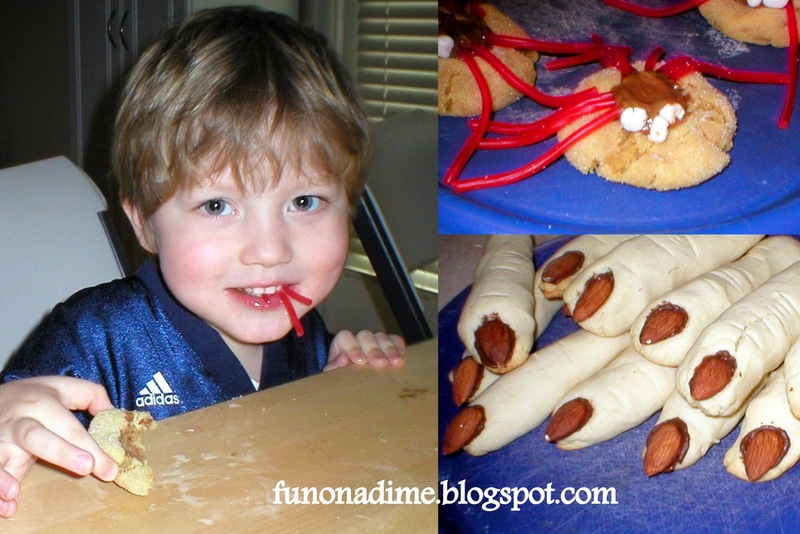 Last year we made these cool Spider Cookies and Witches Fingers. My son has talked about them all year and now that he knows Halloween is coming he has been asking when we will be making them again! These were fun and super easy to make. When we were finished we took goodie plates to our neighbors who were more than willing to enjoy our surplus of Spider Cookes! Go to the bottom of the post to see more fun recipes. Your favorite Snickerdoodle or PB Cookie recipe or a fluffy Chocolate Chip Cookie recipe (minus the chocolate chips) will work well, too. Step 1: Make your favorite Snickerdoodle, Peanut Butter Cookie recipe or a chocolate chip cookie dough recipe that is fluffy. Step 2: Roll the dough into little balls and roll around a bowl of white sugar. Bake in oven as directed. Rolling around in sugar is optional. It gives it a nice sparkle. These pictures were taken last year, so that is why they look so much younger. Step 4: While the cookies are baking prepare legs and eyes. Cut the licorice ropes to desired length for legs. For eyes, cut marshmallows into tiny pieces. Step 5: Once the cookies are done baking, remove them from oven and immediately add the chocolate center to the cookie pressing lightly so it gets nice and gooey. Step 6: You can let them cool for a minute or two. You do not want the cookie so hot it will melt your legs and eyes, but you want you chocolate melted enough that your eyes and legs will stick to it. Make sure you stick the legs in the chocolate for the best hold. Step 7: Have fun and get creative. My son liked to make his cookies with three eyes and 6 legs. He was pretty proud of his work! We also made these Witches Fingers and you can find the recipe for them here. We used chocolate chips instead of red decorating gel. I just placed the chocolate chip on the edge of the finger when it was warm and then pressed the Almonds on top finishing this creepy creation. To be honest, the recipe did not taste very good, but the kids sure loved to look at the fingers. It would be a great party treat and maybe use a yummy sugar cookie recipe instead so they taste better! Last year my sister-in-law made these Witches Hats, too. We did not get a chance to make them but they are on the menu this month because my son still remembers that we did not make them! =) There are a lot of other fun ideas on the site with the Witches Hats link. So have fun baking and make sure to share the goodies, so you do not have to eat them all. That is what neighbors and friends are for! We have been trying out some Halloween dishes too – your fingers look very realistic! Love the linky! We have been making decorations all week. Hoping to decorate the outside this weekend!! How cute are these? My kiddos would just love them! Both are very creative. Looks like your kids enjoyed them. I love those spiders! They sound yummy and are uber cute! I've found that those fingers are always a big hit with kids too! Thank you for the linky party. I linked up my most recent project, which I worked on with my two girls for a class party. Looks like I just became your 200th follower. Cool beans! Cool Spider cookies – I'll have to make those for my nephew – he loves – Spiderman. Visiting from the Toucan Tribe. Thanks for hosting! I am looking forward to seeing everyone’s ideas! Oh my! your house is spooky!!!! Love it! Thank you for linking up to Kids Get Crafty! Much appreciated!! Been making my list of halloween recipes to start on – these look so fun! My little guy will adore the spiders! I’m visiting from Kids Get Crafty, and I’m adding my link to your link party too! I love the spiders. My husband would love to have the fingers. The finger nails are made of one of his favorite foods. 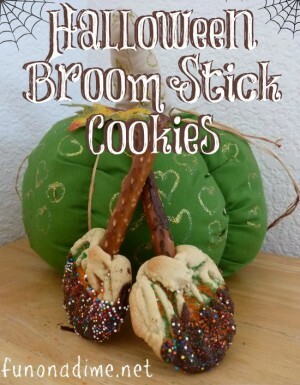 Oh my heck the cookies are so fun and looks easy to make…think I’ll try them out. Thanks for the idea!